You know, I don’t remember being this moronic in college. These people are the very definition of ‘useful idiots.’ How could you possibly not know how filthy rich the Hildebeast is? Oh, I forgot… they watch The Daily Show, as if that is news. Major face palm. Bernie Sanders is such a winner as well… Now, these principled young Dems are turning to an old white guy, whose reported net worth is about 460k. Bernie Sanders, a candidate who is currently discussing 90 percent tax rates and why he believes women want to be raped. His winning campaign slogan is: “You don’t necessarily need a choice of 23 underarm spray deodorants when children are hungry in this country.” Yeah, he’s a real winner alright, just about as much as Hillary Clinton. 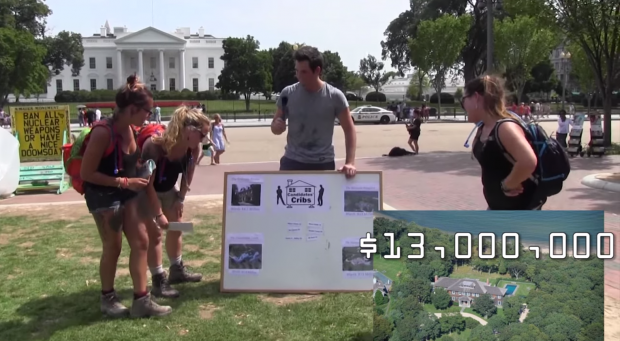 When Campus Reform correspondent Cabot Phillips quizzed young people on the lavish “cribs” of 2016 presidential candidates outside the White House, he got a variety of guesses — from Marco Rubio to Ben Carson and even Donald Trump. What the respondents didn’t realize was each of the four multi-million dollar homes featured in the quiz — valued as high as $13 million — once belonged to Hillary Clinton. “What? !” one women responded after learning the truth. “What, really? You’re pulling my leg,” another man said. Several of the respondents also agreed the revelation about Clinton’s luxurious lifestyle makes her less “relatable” as a candidate leading up the 2016 election. The Clintons are worth a cool 80 million or so and that is before the graft of the Clinton Foundation. The woman is a venile murderess who thinks being president is somehow ‘owed her.’ I seriously don’t get how anyone could be supporting her OR Bernie Sanders. Unless of course, you are for the most evil and corrupt candidate running. And in America today, well… that just might be the case. Just sayin’. These facts may sway a few young voters, but they are so brainwashed, I don’t think it will make much difference. And with the love affair going on out there for the whack job, socialist, pervert, Bernie Sanders, I despair for the future of this nation. Clinton and Sanders are both Marxist elitists, so take off your shocked face.